Mt. Mizugaki with its precipitous granite crags is a popular hyaku-meizan mountain in the Chichibu Tama Kai National Park. This past May I missed the opportunity to climb its peak due to snowed in trails from Kawakami Village and last year making the detour proved too much of a challenge hiking to Mt. Kinpu. The hike can be comfortably completed in a day provided your on the first morning bus, though note on weekdays the last bus departs at 15:25 an hour earlier than weekends and public holidays. Getting to the trail head is explained here in the Mt. Kinpu hike but essentially entails taking a train to Nirasaki Station with a connecting bus service to the Mizugaki-sansou 瑞牆山荘. From the hut look for a sign pointing to the Fujimidaira-goya 富士見平小屋 which takes around 50 minutes. 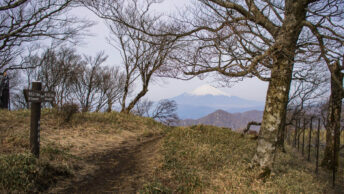 For this hike I camped two nights at the Fujimidaira-goya with respective day hikes to the Dainichi Boulder 大日岩 and Mt. Mizugaki (2,230 m). After filling up with water just below the hut, take the trail veering off to the left. The first section climbs a little before descending to the Amatori River 天鳥川 where you find a small rest area. From here to the summit there is a 400 metre gain in elevation. While the hike isn’t particularly difficult, ropes and chains are available to safely negotiate some of the more gnarly sections. The trail is also quite rocky so take care if hiking in the colder months with icy rocks. When you reach the first ladder look for the collection of tree branches propped up against the boulder in an amusing formation. While the trail is well marked out with painted arrows and tape I still occasionally found myself searching for the safest route. Reaching the summit should take around 1 hour 40 minutes from the hut and making an early start meant there where only a couple of other hikers when I arrived. The views are spectacular even in summer especially of Mt. Kinpu and Mt. Fuji made a brief appearance. In clear weather both the Southern and Northern Alps are clearly visible on the horizon. On the way up you should have also noticed the Ooyasuri Boulder 大ヤスリ岩 which along with being the most prominent of Mt. Mizugaki’s granite towers is also popular with climbing enthusiasts. 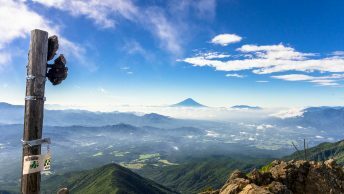 From the summit the options include retracing back down or alternatively hiking the longer Kuromori course 黒森コース a loop trail though takes around 4.5 hours. If you return the same way I recommend spending some time exploring around the Amatori River with its crystal clear rock pools making a wonderful place to cool off in summer.